I must admit, I am a bit of a workaholic. I am a vice president in asset management and Rob works for a risk and insurance services firm. Coincidentally, our best friends, urging us both to get out more, downloaded the Tinder app for us. Rob and I began talking and learned we both love hockey. For our first date, we played a pick-up game of roller hockey in Stuyvesant Town. On Thanksgiving weekend a year later, we went to Peter Dillon’s Pub, where we first said “I love you.” To my surprise, Rob signed up for karaoke and began singing “Amazed” by Lone Star. During the guitar solo part, Rob walked to where I was sitting and proposed! I said yes and with the confidence of a rock star, he returned to the front to finish singing to me. Growing up, my late father would always take our family to Waterside for special dinners. We all loved the NYC skyline and the delicious food. Waterside captured all the elements we were looking for in a reception venue — a gorgeous skyline view, intimate yet spacious reception rooms, great food, and a convenient location for our friends and family to get to. We booked it the day we went to visit. We worked with Shantal Videla, our wedding coordinator, to plan the details of our “Big Fat Greek Wedding” reception. We greatly appreciated her patience and experience. Shantal helped us with everything from the table design and floor layout to décor and menu items. We were married at our church, which has an altar flanked by beautiful handmade mosaics of Byzantine iconography. Reverend Father Peter Zougras created a beautiful ceremony. After, our limo driver took us to Waterside. 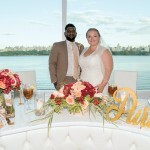 The Hudson River and the skyline made a beautiful backdrop for pictures! Guests raved about the view from the room’s floor-to-ceiling windows and the wide assortment of foods at our cocktail hour. We had a premium open bar, dozens of butlered hors d’oeuvres like crudités and grilled vegetables, and several food stations including a pasta station, a Mediterranean station, and a seafood bar. All the food was delicious but the jumbo shrimp was the biggest hit! The tables in our ballroom had tall centerpieces filled with white floating orchids and candles, each surrounded by rose petals and votives. To follow the Greek tradition of “boubounieres” or favors, we gave each guest a bottle of wine with a tulle bag of “koufetes” or almonds, attached. The bouzouki player, who led the Greek singing, and the pianist, who sang American classics, were both amazing. To wish us luck for the future, dollar bills were thrown at us while we were dancing. For dinner, we offered chateaubriand in a bordelaise sauce, Chilean sea bass in a lemon thyme butter sauce, and chicken piccata with capers in a white wine sauce. Our delicious wedding cake had a unique hockey topper with bride and groom replicas of us, holding hockey sticks and wearing skates! A big thank you to my mother for her love, support, and project management. Thank you to our friends and family for helping make such a fabulous event. Thank you to all our vendors. We recommend each one of them. A special thank you to Shantal and Waterside for their help every step of the way!